So basically, the Black Mamba is a snake that can strike with devastating speed and accuracy, resulting in a quick death you did not even see coming. It has no conscious when it is in attack mode and really the only way to stop it is to avoid it at all costs. This is the nickname Kobe chose for himself. The Black Mamba was not bestowed upon Kobe by a fawning fanboy following a fantastic fadeaway. It was not given to him after he stuffed down a breakaway jam on some poor unsuspecting high schooler while Kobe was at Lower Marion. Kobe bestowed it upon himself. That is what makes it so fascinating, that Bryant himself wanted to be known as Black Mamba. Doesn’t that tell you everything about Bryant you could possibly want to know about Bryant as a player? Ruthlessly efficient and always ready to strike, Kobe is always looking for his shot first and his teammates second. It never was a huge issue because he is so ridiculously talented, but Kobe is undeniably a selfish offensive player. Think of every Kobe Bryant shot. All of them have a ridiculously high level of difficulty, but it is ok because Kobe can make them. His reasoning, as detailed by Bill Simmons in his excellent column The Kobe Question, is that the best way for his team to win is for him to score whenever he can. That can come at the expense of his teammates psyche and moral, but Kobe’s fearlessness and tough-guy approach supposedly trickled down to his teammates and allowed them to follow his lead. Fast forward to this year. The Lakers are having the most difficult season the franchise has had since Biggie questioned Mr. Shakur “Who Shot Ya?” The team is in utter disarray with no identity or togetherness. It was time to try something new, something drastic, and Kobe delivered. The last two games, wins for the Lakers over the imposing Jazz and Thunder, Kobe has averaged 17.5 points, 9 rebounds and 14 assists. More importantly, he only shot 22 times (making 15 of them), which would be a tame total for one game let alone two. Watching the game it was clear Kobe had a completely different mindset. It was not “What do I have to do to win this game”, but rather “What does my team need me to do to win this game” and the results have been astounding. From a pure basketball prospective, never have we seen Kobe play more beautiful basketball. Yes, the twisting fadeaway over two defenders is a fantastic shot, but it is only as great as how putrid the misses are. It was sometimes so frustrating to watch Kobe take ridiculous shots when easier ones were available, and it appears he is beginning to understand that. This is not the Luke Walton-Smush Parker-Kwame Brown Lakers. This is a squad jam packed with Hall of Famers, and Kobe is the only one talented enough to make it all work. Well the last two games he has made it work. Countless times he got the ball at the perimeter and posted up, looking ready to pounce for his patented fadeaway jumper. Apparently, the whole defense also thought Kobe was about to jack up another shot because he would square to shoot and find the eyes of several defenders converging on him. 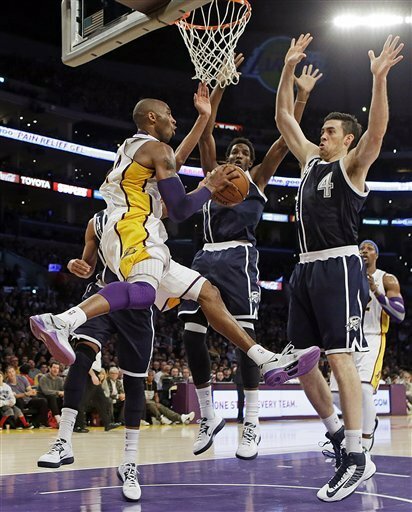 Kobe recognized this and at the last minute delivered a bullet pass to a teammate for an open jumper or layup. The ball started to move better. Dwight became more engaged on defense. Pau looked like Pau again. All because Kobe decided to play a little team basketball. 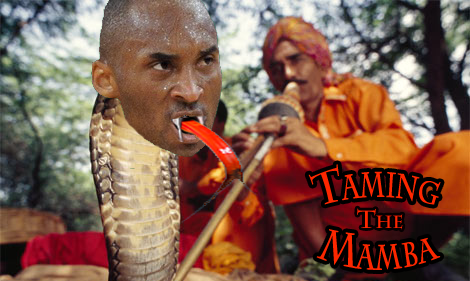 So Kobe has tamed the Mamba; for now. The big test is when push comes to shove in the waning minutes of a close game, will Kobe be able to control his inner Mamba and play team basketball? I remain skeptical, but only time will tell. For now, all we can do is sit back and enjoy Kobe playing the best team basketball of his career. « Who is the Most Valuable Player?